This is a fun activity for the kids to make during spring time. Using some cupcake liners, create some flowers and attached them together to make a pretty and colourful garland or decorative piece to brighten any room. 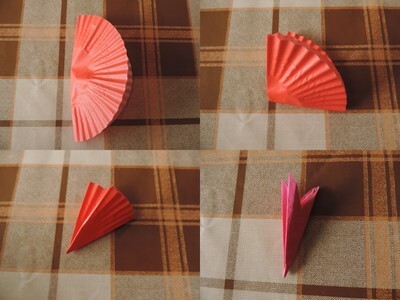 Fold in half, then again in quarter, again and again. Trim the edge in any desired shape. Different type of trimming will lead to different petal shapes. Repeat process until you have the required number of flowers. I combined 3 flower cuttings to make one flower. Once you are happy with the flower combinations, place sticker on top of each of them. Glue all flowers and leave to dry. Once dried, tape flowers to string to make a garland.